A rich source of protein, vitamins, minerals, essential and nonessential amino acids, fatty acids, trace elements and the carotenoids beta carotene, beta cryptoxanthin and zeaxanthin. Our tablets are 100% pure spirulina. For more than 3 decades spirulina (spirulina platensis) has been the number one choice for supplementing a vegetarian diet. It’s a great source of a multitude of vitamins, minerals, and essential fatty acids which are extremely hard to sustain at sufficient concentrations with a vegetarian diet. Spirulina is regarded by some as the world’s richest natural whole food source due to its nutritional profile. Body By Natures Pure Spirulina contains high levels of iron which promotes haematopoiesis (formation and development of red blood cells). It is vital that all 9 essential amino acids must be present at the same time in order for the body to synthesise protein which will be used for maintenance and repair - our product contains everything your body needs to complete this process. Cholesterol reduction and inflammation. Our pure Spirulina contains pure Spirulina Platensis – a rich source of all the essential components your body needs such as protein, vitamins, minerals, essential and nonessential amino acids. Vegetarians and people who have poor diets should consider this supplement. Spirulina platensis, a cynobacterium, had been found to display a variety of immune-stimulating and antiviral activities. It is harvested once it reaches maturity (around four months), and then dried ready to be used in our nutritional supplement. This method has been traced back as early as the 13th century. 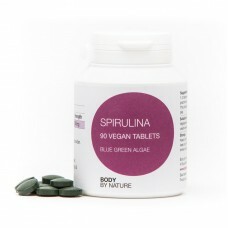 Our tablets are 100%pure spirulina. A unique process allows the spirulina to be directly compressed and made into tablets without the use of additives. The tablets can easily dissolve much faster, thereby increasing the bio-availability of the nutrients. *Spirulina can also be used as an energy booster and aid with a healthy detox. Detoxing the body using our product is done by eliminating toxins in the body to keep it clean. Most people looking to detox on programs will start with a high dosage of spirulina and then lower their intake after the program has finished. A majority of toxins that can build up in the body if you are not receiving the essential nutrients can cause headaches, fatigue and other problems. When given to children with radiation sickness in Belarus 1993 they recorded results of 50% less urine radioactivity when consuming Spirulina. 1–2 tablets daily or take as directed by a practitioner. Do not exceed the recommended daily intake. This product should not be used as a substitute for a varied diet.